The Aquarium is sponsoring an expedition to explore seamounts, or underwater volcanos, in Costa Rica, along with several leading underwater exploration and research groups. Over the next couple weeks, look for pictures and stories about this expedition from Aquarium explorers. 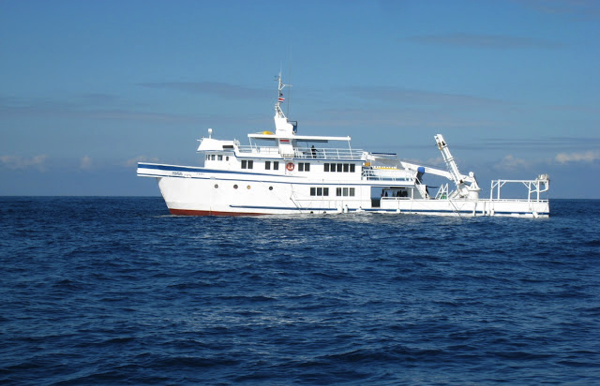 Learn about previous expeditions to study seamounts in the Sea of Cortez and Raja Ampat, Indonesia. Today's post comes from Alan Dynner, New England Aquarium Overseer (and former Chairman of Board of Overseers and Trustee). Dr. Larry Madin and I arrived in Costa Rica, a lovely, progressive, stable Central American paradise, on a sunny, mild February 27. At our hotel in San Jose, we met Mike Velings, a Dutch businessman and conservationist, and the next morning, after a beautiful 1 1/2 hour drive to Puntareanas on the Pacific coast, boarded the M/V Argo and left on the noon tide for Cocos Island, 300 miles to the southwest. On board are Brian Skerry, National Geographic underwater photojournalist and Explorer in Residence and Overseer at the New England Aquarium; Larry Madin, Executive Vice President and Director of Research at Woods Hole Oceanographic Institution, and an Overseer at the Aquarium; Dr. Peter Auster, research professor of marine science at the University of Connecticut; Dr. Jorge Cortes, professor of marine science at the Center for Marine Science and Limology at the University of Costa Rica; Luis Lamar, Brian Skerry’s assistant; Kevin Joy and Lance Horn, pilots and technologists for the remotely operated vehicle (ROV); and Mike Velings. Dr. Greg Stone, Senior Vice President, Marine Conservation, and Chief Ocean Scientist at Conservation International, and Senior Vice President for Exploration and Conservation and an Overseer at the Aquarium, will join us in a few days. 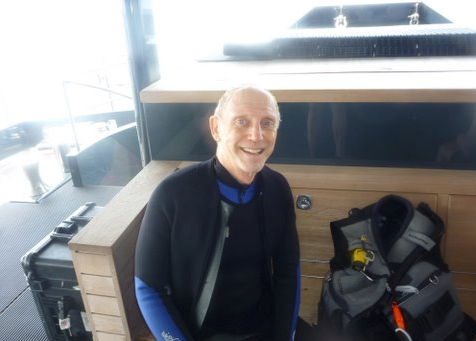 I’m on board as a lifetime diver and conservationist, and former Chairman of the Board of Overseers and Trustee, currently an Overseer, at the Aquarium. Our primary mission on the expedition is for Brian to photograph the Las Gemelas seamounts, 40 miles further southwest from Cocos Island, and for Greg to gather information, for an upcoming article on seamounts they will author for National Geographic magazine. Brian, Greg, and I have participated in two prior expeditions, to the Sea of Cortez, Mexico, in 2008 and to Raja Ampat, West Papua, New Guinea, Indonesia, last year, to collect material for the article. In addition, Larry Madin, one of the world’s foremost experts on pelagic invertebrates (like jellyfish) will collect and study specimens on site. 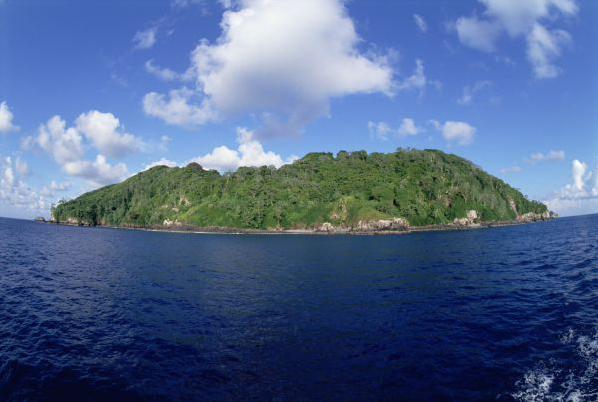 Jorge Cortes, an expert on coral reefs and marine animals of Cocos Island and the surrounding areas, and Peter Auster, known for his work on seamounts (underwater mountains, usually of volcanic origin), will gather data and provide information. The Argo, a 135-foot ocean exploration vessel with an experienced crew led by owner Avi Klapfer, a legend in marine operations, is perfect for the trip because she has on board a three-person submarine operated by a special crew that can take us down to the 525-foot deep peaks of the seamounts and beyond. In addition, we have an ROV on board for unmanned exploration of the seamounts. We arrive at Las Gemelas after 40 hours of smooth sailing on unusually calm seas and prepare for the first dive in the submarine, which has been specially rigged with cameras. Brian and I descend in the sub with pilot Shmulik Blum, to the seamount floor. At a depth of 140 feet a hammerhead shark approaches cautiously, then disappears in the gloom with a flick of its tail. The light grows dim as we reach the seamount summit. Our floodlights show a floor of gently sloping basalt rock, punctuated by tall rock ridges and peaks. The rocks are covered with deep water corals, brittle sea stars, sea urchins, and large schools of red basslets. Around the base of the ridges and peaks swim huge groupers, hunting for prey. I’m blown away by the amount of sea life, which is much more dense and various than life on the sea mount in the Sea of Cortez that has suffered from overfishing and other man-made stresses. The only disappointment is that all over the bottom and on many rocks are old fishing lines and ropes, a real threat to our submarine; the biggest danger for a sub is getting snagged by fishing tackle. Then a huge mobula, a type of ray, appears in front of our dome. I almost fall out of my seat in surprise, but luckily grab my point and shoot digital camera and take an HD video of the visit. Shmulik maneuvers the sub under Brian’s direction as he takes images of the world of the seamounts. I’m thrilled and too soon we depart for the surface. For more pictures and stories from this expedition to Costa Rica, follow Greg Stone on Conservation International's blog as he prepares for this expedition and finally sets foot in Costa Rica.